Miami’s New Stadium: Innovative or Just Plain Ugly?? We all knew the Marlins had something cooking this offseason when they went after Pujols, Reyes, Buehrle, and CJ Wilson all at once. And they successfully signed 2 of them: Reyes and Buehrle. The required re-building project that was forgotten about though was the new stadium needed for the move to Miami. To make matters even worse, the Marlins decided to throw in some aquariums behind home plate. A unique idea but none of the stadium designers must have had fish tanks growing up. Sure they double layered the fish tank glass and had Gaby Sanchez test their durability, but I’m almost positive that a ball striking the glass will send enough vibrations through the tank that any fish in the vicinity will be belly up due to extreme pressure pulses transferred through the water. Some poor father is going to have to explain to their 5-yr old kid why that fish is swimming upside down after the 3rd inning. 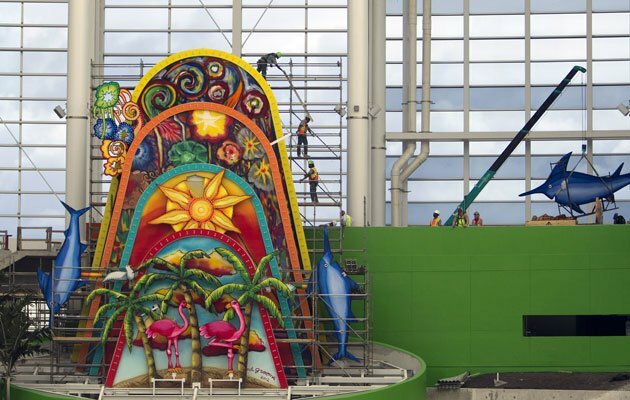 It should be an interesting season for the rebuilt Marlins, maybe next offseason they will spend more time rebuilding their new stadium’s eyesores instead of their physical team. wow that home run feature is just…just…um…amazing?